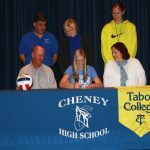 Sydney Peitz, CHS Senior, signed a national letter of intent to play volleyball next season at Tabor College in Hillsboro, KS. 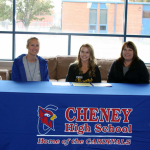 Here to share in the event were her parents, Jerry and Shari Peitz, CHS Head Coach Sara Walkup, Tabor coaches Amy Ratzlaff and Sam Cohlmia, and a host of her Cheney High School teammates. 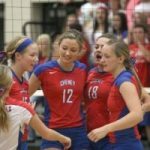 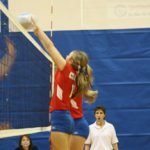 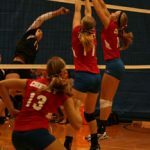 Cheney defeated Kingman (25-11,25-8), Conway Springs (25-12, 25-22) and Garden Plain (22-25,26-24,25-17) to advance to the Class 3A Kansas State High School Volleyball Championships next weekend in Emporia, Kansas.